De Ponte Cellars is the site of one of the oldest vineyards in the Willamette Valley. This scenic property up in the Dundee Hills was acquired by the Baldwin family in 1999 and soon De Ponte Cellars Winery was born. The name De Ponte comes from the matriarch of the Baldwin family, Shirley Baldwin. De Ponte, her maiden name which is of Portuguese origin, honors her father who grew grapes and made his own wine in California's San Joaquin Valley. De Ponte released its first Pinot Noir to critical acclaim in 2001, reflecting the dedication of the Baldwin Family and its French Winemaker Isabelle Dutartre to produce a remarkable wine. Dutartre learned the art of winemaking in her home of the Burgundy region of France and each vintage reflects her uncompromising commitment to quality and tradition. In addition to its Pinot Noir, De Ponte is known for its Melon. The Melon grape is not only rare in Oregon, but also in the whole U.S. The original growers thought the vines would produce Pinot Blanc grapes, though they were mistaken. It turns out the varietal they planted was Melon de Bourgogne, which is identical to the grape used in France's Muscadet which is produced in the Loire Valley of France. The result is a delightful white wine which has generated a loyal following for De Ponte. 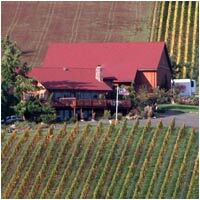 De Ponte is located in the Dundee Hills and in the heart of Oregon's first ever American Viticulture Area (AVA). The Dundee Hills are home to some of the most recognized and esteemed vineyards in the Willamette Valley. The designation of the Dundee Hills AVA is a sign of the growing prominence of this area in Oregon and American winemaking. The Dundee Hills were formed 15 million to 17 million years ago by fluid lava followed by a massive tectonic uplift of the earth, which occurred later, roughly 5 million years ago. The Dundee Hills are famous for red clay-loam soils deposited by ancient floods. This volcanic soil has excellent mineral content and drainage. Add the benefits of dryer and warmer weather than the surrounding areas, and the results are ideal conditions for Pinot Noir. These exceptional growing conditions consistently produce excellent wines, wines of great clarity, depth and character. You are invited to learn more about De Ponte by visiting our vineyard, our winery and our tasting room.